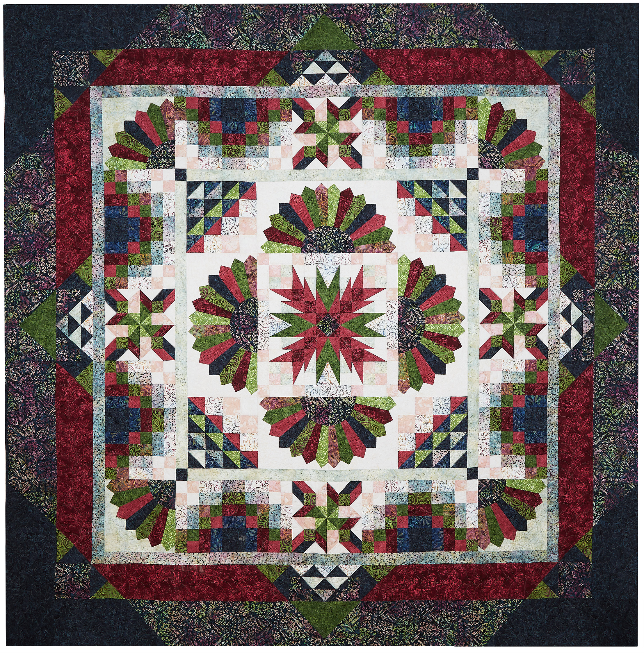 The Tonga Lush collection features fourteen fabrics in a palette of creams shading to soft blush, rose into burgundy, and vivid greens all nested in a navy-blue base.The Lush Block-of-Month quilt, 108" square, was designed to showcase this beautiful collection. The Dresden blocks are made with curved pieced handles and finished points for simple applique by machine or hand. The blooming center block points are easily made with Creative Grids ruler or the paper templates included with the pattern. Throughout the quilt the classically pieced blocks are enhanced by unique color placement. This BOM will begin in April 2019 and run for 10 months at a cost of $ 26.99 per month. Kits will include patterns, wing and a prayer Dresden template and all fabrics needed to complete the top and binding. Those participating in the Tonga Lush BOM may purchase an optional insurance pack that includes on 1/4 yard cut from each of the fourteen Batiks used in the Lush quilt. The insurance kits will be ready with the first month.